Tanning has gained so much popularity since a renowned fashion designer which goes by the name Coco Chanel incidentally brought the idea out to the fashion industry. In 1923, while yachting in between Paris and Cannes in the sun, Coco Chanel came across the idea of the so-called “Tanning” which has now become a song in everyone’s mouth. With various tanning products being sold in today’s market to help achieve a darker tan, tanning has been a blessing for most people both males and females. One of the tanning products is the tanning oil. You can find tanning oils in many brand names, fragrances, and packaging but anyone that you can lay your hands on will serve just the same purpose that you desire. 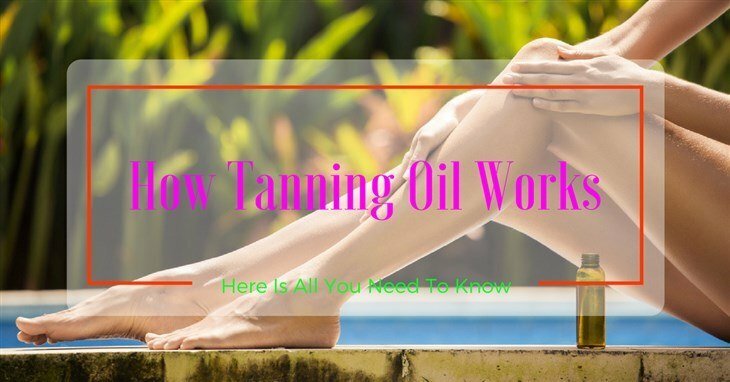 Here in this article, we shall be discussing what tanning oils really are and how tanning oil works. Hope you love it. How Quickly Does Tanning Oil Work? Tanning oils otherwise known as tanning moisturizers are those skin-care oils that have the ability to help you accomplish a tan and could possibly contain what is known as SPF (Sun Protection Factor). You can possibly find some that don't have SPF and they are the ones generally used for indoor tanning. But the ones for outdoor tanning usually contain sun protection to shield the skin against any harmful sun rays or radiation. This tanning oils help you tan by conveying blood to your skin surface and enhance melanin generation in order to darken the skin complexion. They give a slight prickling sensation when applied. Be careful, as it might cause severe irritation to the skin and result to excessive reddening. Sunflower oil: it is exceptionally useful for treating weathered, aged and dry harmed skin. Coconut oil: moisturize and protect the skin. Lanolin: it prevents any form of irritation that may be caused by different oils and generally used for moisturizing either sunburned or dry skin. Titanium Dioxide and Zinc Oxide: This is a blocking substance for the skin and prevents any harm that may be caused by intense sun exposure. Cocoa Butter: It is useful for dry chapped parts of the skin and is generally used to lighten stretched marks and even prevent it. Green Tea Extract: It neutralizes free radicals generated as a result of the UV radiation from the sun. Sweet almond oil: It is an incredible emollient used to enhance the state of chapped hands and any skin inflammation. Vitamin E: They give protection over skin cancer and could possibly slow down the rate at which skin gets damaged. Whenever you are on the beach, don’t hesitate to apply tanning oils in a moderate amount everywhere on your body. Your tan can last you for around 2 weeks. You can even prolong the application for of a couple of days so that the tan can get deepened. Tanning oils can give your skin complexion a livelier look especially if you are a type with a fairer skin accompanied by a pale tone. However, it might take at least 1-day of sun exposure for the skin to begin to stimulate melanin based on the measure of melanocytes present in the skin. In such case, ensure your preferred tanning oil contain tanning quickening agents, similar to amino acid tyrosine. Always be patience during the course of your tanning oil application. Don’t look forward to a salon-like tanning outcome. As you apply the oil, always place a towel down to cover whatever thing you will be sitting on during the course of the application. Pour a least a quarter-sized measure of your chosen tanning oil into the palm of one of your hand. Rub it tenderly over your other palm. Do bend over and apply the oil to the highest points of your feet. Moving your hands up to your lower legs or ankles, spread whatever oil is left on you all around your calves and lower legs. Again, pour a more quarter-sized measure of the tanning oil into your hands. Don’t worry over applying too much–more is much better than little. Move your hands up your leg area, applying the oil to anywhere that you feel the sun will hit, such as the back of the knees. Then, spread the oil as far as possible up to the bikini line. At this point, you might be needing more oils. Rub the oil everywhere starting from your midsection (otherwise called belly) to your lower back. If there is no one available to rub the oil on both your upper and middle back, slant the oil bottle behind your neck so that little stream of the oil will keep running behind you to your shoulder blades. Try as much as possible to reach your back and spread the oil evenly with your hand. If you are using a tanning oil that states “it won't bring about breakouts”, complete the tanning by applying oil right to your face, neck and upper chest. Always shield the eye area, regardless of what kind you utilize). Make the tanning oil to seep right into your skin for a couple of minutes before you rest to tan. If you are sweating vigorously or if you accidentally immerse yourself in water, apply tanning oil again every two to four hours. You may likewise need to reapply it in case you’ve been lying on one side and decides to change to your opposite side, as some oil may have been wiped off by the towel or you personally may have sweated some oil off the skin. We believe you have really gotten a lot of intriguing information about the functionalities of tanning oils. Never forget to always keep your skin hydrated by making use of a recommended tanning oil to prevent the skin from peeling off as a result of intense sun exposure. A wide range of tanning techniques has their respective side effects. but, the concentration of the Sun rays on the skin is drastically reduced if you use a tanning oil and will give you a sun-kissed darkened tan if properly applied. How has tanning oils been working for you? Do you have any other methods or tips to share? If so, you can leave us a comment below! We would love to hear from you.